The Department of Transportation imposed a $30,000 penalty on United Airlines for breaking price advertising rules. (CNN) -- The U.S. Department of Transportation slapped United Airlines with a $30,000 fine Friday for violating price advertising rules, and the airline also will have to pay the balance for a previous infraction. Under DOT rules, airlines must disclose the full price of air travel to consumers. "Our fare advertising rules are designed to ensure that consumers know how much they will pay for a ticket and are able to compare prices when choosing which carrier to fly," Transportation Secretary Ray LaHood said in a statement. The department found that United failed to disclose a 7.5 percent federal excise tax for 60 hours on the initial results page of its Web site. 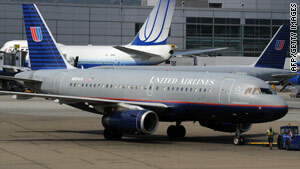 United said it is committed to advertising its fares clearly. "In this unique case, due to a programming error, the initial fare display inadvertently placed the 7.5 percent federal excise tax in the 'taxes and fees' section, rather than in the base fare," said spokeswoman Sarah Massier in an e-mail. "Immediately upon learning of the programming error United took action to move the tax to the base fare." Government taxes and fees per passenger are the only charges that are not required to be included in the published fare, according to the DOT. The new penalty means United also will have to pay the balance on a fine for a violation over the summer. In August, the DOT fined United $75,000 for not disclosing taxes and fees in the initial advertised fares on its Web site and for showing one-way fares that were only applicable for round-trip travel. The airline was required to pay $37,500 of that penalty, with the understanding that half would be forgiven if it had no further violations within the next 12 months. United now is required to pay the other half of the $75,000 fine.